Subject: SCERT, Telangana, Hyderabad - Constitution of District Common Examination Boards (DCEBs) in the newly formed districts, Distribution of Accumulated Funds to the New Districts and certain guidelines on the effective functioning of DCEBs - Orders - Issued - Reg. All the District Educational Officers in the State are hereby informed that, the District Common Examination Boards have been established and being functional in the Erstwhile 10 Districts and attending the Examination works for classes I to X. In this regard it is proposed to formulate DCEBs in the newly formed districts and make them functional during the current academic year of 201 7-18 onwards. 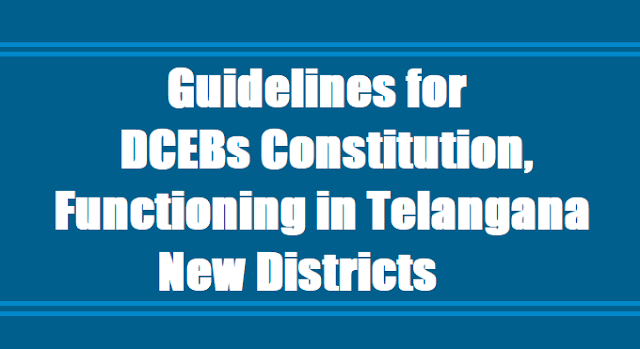 Following are the instructions for establishing DCEBs in the new districts, distribution of accumulated funds to the new districts and other guidelines for effective functioning of all the DCEBs in the districts. 1. Dividing the outstanding balance of DCEB funds as on 30.07.2017 and providing to new districts: The DEOs are directed to divide the outstanding cash book balance of DCEB funds as on 30.07.2017. A Statement of outstanding balance with DCEBs as on 20.05.2017 have furnished by the DEOs of erstwhile 10 districts and the same is enclosed. However for the purpose of distribution of the present balance of funds as on 31.07.2017 may be taken. The funds must be apportioned (available cash book balance, advances & FDs etc) to the new districts. before 03.08.2017. The procedure to be followed in apportionment of DCEB balances: Divide the outstanding cash book balance, advances & FDs of erstwhile DCEBs into the number of units equal to the number of schools which contributed to the DCEB to arrive at the average unit value of each contributing school. For example: the outstanding balance of one erstwhile District is Rs. I 0.00 Lakhs, number of contributing schools to the DCEB in the erstwhile District is 500 schools. The Unit Value= Rs.10,00,000 /500 Schools= Rs.2,000/- per unit. Based on the unit value, the amounts may be distributed among the Districts in proportion to the number of schools units that contributed to the DCEB. •The DEOs of 21 new districts are directed to constitute the DCEBs in the respective districts and make them functional duly following the guidelines issued vide G.O.M.S. No. 162, Education, dt: 20.02.1970 and G.O.M.S. No. 17, School Education Dept., Dt: 14.05.2014. The DCEBs must be formed before 02.08.2017.
o Vice Chairman - Senior Deputy Educational Officer in the District. o Secretary - A Head Master with considerable experience, experience of participation in academic activities as Resource Person, committed and responsible person may be nominated by the Chairman from among the members. A committee with DEO, DIET Principal, ACGE, Senior Dy. Educational Officer and Nodal Officer may discuss and select the Secretary to the DCEB. the School Assistants I SGT Cadre. o Members - 11 Members who are Head Masters representing all the Managements in the district such as Government, Zilla Parishad, Aided, Un-Aided Private Schools, Model Schools, KGBVs, Residential Schools, etc. and covering geographical areas I legislative constituencies in the district. o Ex-Officio Members - The Principal DIET, CTE, all the Dy.EOs in the district, Assistant Commissioner Government Examinations, Senior MEO shall be the ex-officio members. for a period of 3 years, subject review of performance every year. o The board shall meet at least 4 times in a year in the months of June, September, December and March. The quorum shall be 7 members excluding Chairman. •The collection of fee and amount is varying from district to district, therefore, it is directed to collect the examination fee as given hereunder. • No fee shall be collected from classes I to VIII for the schools under Government Management as per RTE Act. • The fees may be revised alternate year based on escalation of the cost towards Printing, Transport and other related items by SCERT. •The expenditure has to be incurred on the examination activities i.e., Conduct of workshops for the development of question papers, DTP, printing, packing, transportation and other related miscellaneous expenditure, postage, stationery pertaining to examination works. The TA of RPs attending State Level Workshop for the development I editing of question papers. •TA of Chairman, Secretary and Members for journey performed in connection with Common Examination, Board Meetings expenditure. •Expenditure pertaining to the TA of Resource Persons towards monitoring on the implementation of CCE, valuation of papers, communicating Answer Scripts to the parents, maintenance and issue of cumulative records, proper allocations of marks to the formative tools etc. •An amount of Rs. 25,000/- per year shall be earmarked towards maintenance of DCEBs which includes conveyance I honorarium to the Secretary, Assistant Secretary and Sweeper I Attender of the DEO office I High School where DCEBs office is functioning and other things. The District level varying and different practices of payment to the DCEBs Secretaries and other staff need to be replaced with the above. •Transparent procedures: follow tender process for printing of material to ensure transparency and payment shall be made through crossed cheque I online transfer exceeding Rs.500/-. No cash transaction shall exceeding Rs. I 000/- per month. •Audit of Accounts: Accounts shall be audited by the Chartered Accountant firm I Internal Auditors I AG every year and submit the report to the C & DSE on or before August 3151 of Every year without fail. •Accounts are to be maintained by Secretary and shall operate joint signatory saving bank account i.e., Secretary& DEO concerned district. •The DCEB shall perform all the functions of conduct of examinations as per the guidelines given under the GOs i.e., G.O.M.S. No. 162, Education, dt: 20.02.1970 and G.O.M.S. No. 17, School Education Dept., Dt: 14.05.2014. The DCEB Secretary shall develop Resource Groups in all subjects with 10 to 15 teachers per subject and utilise their services and expertise in developing the Question Papers and monitoring the implementation of CCE as given vide G.O.M.S. No. 17. The expenditure towards conduct of Workshops and monitoring the effective conduct of CCE and allotment of internal marks in all the Government and Private schools shall be met from the DCEB funds. •The DCEB shall develop question papers for primary, i.e. classes I to V for the schools under Government Management and classes VI to X for all the Schools under Government and Private Management, get printed duly following the norms and distribute to all the schools well in advance and strictly maintaining the confidentiality. •The Guidelines and blue prints for all the subjects have been developed and communicated through Teacher Handbooks to the teachers and to the Head Masters which may be followed. Further guidelines for preparing question papers and nature of questions have been issued vide G.O.M.S. No. 17, School Education Dept., Dt: 14.05.2014 which may be followed. The quality of the questions which differentiate students based on their intelligence and creativity must be ensured. The Question paper developers shall not copy questions from textbooks and guides rather they should think, go through the textbook and develop meaningfully which makes children to think and express rather than memorize and repeat the information given in the textbooks. Keep quality of Academic Standards as expected. While developing Question Papers, the principles of valuation also shall be developed, printed and provided to all the schools in a secured manner. •The learning outcomes for all the subjects from classes VI to X have been developed based on learning outcomes developed by NCERT. The booklets on learning outcomes for primary and upper primary I high schools have been printed and provided to schools @ 2 copies per school which need to be kept in the school library. Learning Outcomes are the basis for developing question papers and conduct assessment i.e., Both formative and Summative as a part of CCE. The State and National Level Surveys on children learning achievement will be based on the learning outcomes. Therefore, the DCEBs are responsible to develop awareness on learning outcomes which are subject specific and class specific among the concerned teachers and Head Masters of all schools under the management of both Government and Private. •The District Common Examination Board may also frame Bylaws if necessary for the smooth working of the scheme in conformity with the above rules subject to the approval of the Director of School Education vide G.O. M.S. No. 162, Education, dt: 20.02.1970. •All the DEOs including new districts to prepare question papers for SA-I for all the subjects before 12.08.2017 and attend the workshop for editing and finalization at State level by the SCERT during 18th and 19th for the first 15 districts and 20th and 21st for the remaining 16 districts. The DCEB Secretary shall attend the State Level Workshop with 7 RPs@ one per subject and also one person for Urdu where Urdu Medium Schools are being functional.